Sap IS-Retail has multiple different features comparing to classical ECC solution. One of them is article valuation and multiple variants that offers. In ECC material valuation is cost oriented that means that either procurement price is taken into account or cost of production are influencing material price from valuation perspective. Stock valuation of material in ECC and is done based on stock quantity * material valuation price, where valuation could be either standard price or moving average price. I assume that topic of ECC material valuation is old and quite well known so let me go to IS-Retail features. 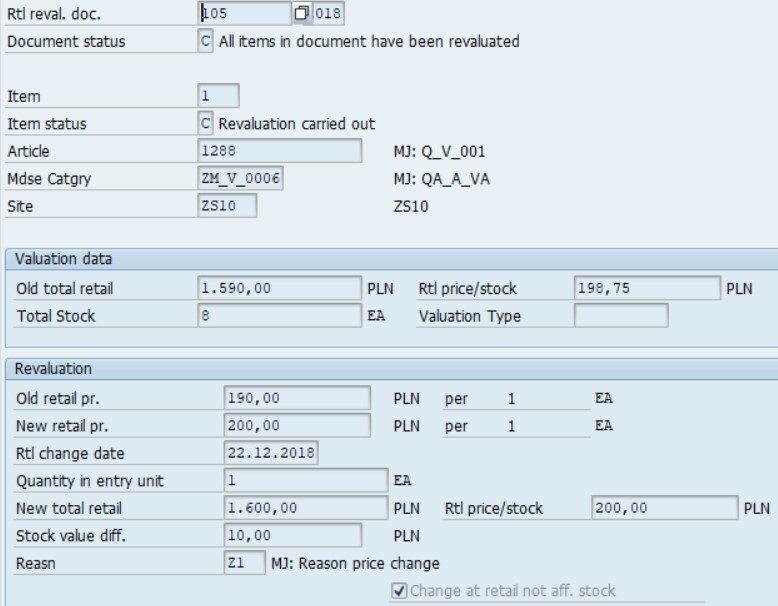 In SAP IS-Retail valuation at retail price has been introduced. This approach of valuation is more trade oriented as sales price is a leading factor not like before cost of procurement. For articles that are manged on quantity and value update, valuation based on standard price or moving average price is required and retail price is optional. For non-article-based inventory management it is a requirement (value-only article inventory management or merchandise category-based inventory management) as valuation at retail prices is a necessary starting point for the valuation at cost price and is therefore relevant for accounting. Based on calculated by system cost price that is coming from sales price system is doing valuation of goods movements. Inventory Mgt Profile – this profile allow you to predefine how and on which level valuation is done in site. Article, merchandise categories, merchandise categories hierarchy or group of articles. When a goods movement is posted, the system searches for a value-only article. For every item in an article document, the system checks whether the posting is to be made to a specific article or to a value-only article. 0001 – Profile means that stock is always manged on material bases. 0002 – Profile means that if value-only article is assigned merchandise categories then stock is managed on value basis otherwise it’s on material basis. 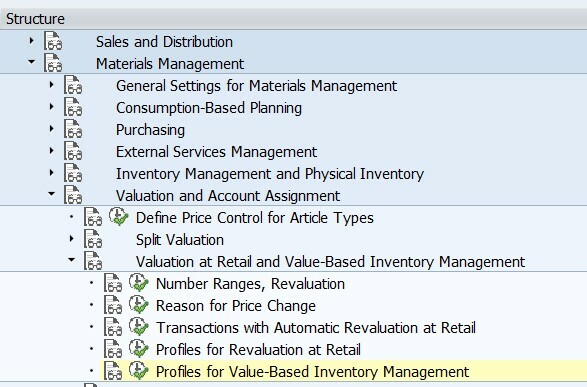 0004 – Profile means that stock is managed always on merchandise category (Value-only article) but exceptions are possible. 0005 – Profile means that stock is managed at hierarchy material level 1. Valuation at Retail – to do the activation of valuation on retail price, simply tick this checkbox. Counting – indicates if before revaluation is done, stock needs to be counted. This setting is valid only for articles manages on quantity and value as counting could be optional but it’s mandatory for value managed articles only. Promotion valuation – as each promotion usually has lower price, this indicator is telling if stock should be revaluated separately during time of promotion. This option if valid only if split valuation for promotion is not active. 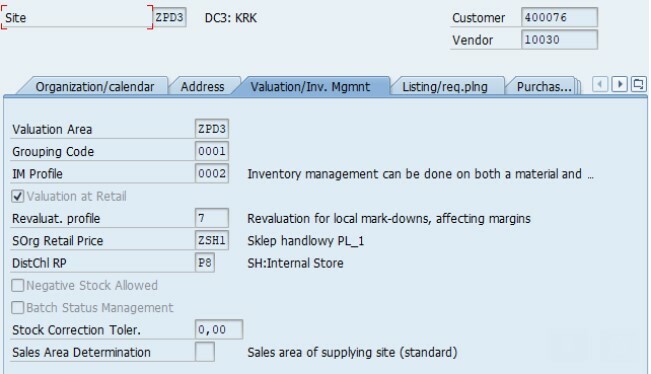 Local mark-downs – indicated if prices stored outside central IS-Retail are sent from local system and partial valuation for different price is executed in IS-R. Checkbox used as well during POS inbound sales price valuation for stock transfer orders PO. Not affecting margins – after sales prices change revaluation of stock needs to be done. This parameter tells if accounting document will be generated for price difference. Posting is done to BSX – inventory posting transaction and offset to UMB – Gain/loss from revaluation. Partial stock revaluation – only part of the stock is revaluated with new price. Only useful for local mark-downs and promotions. More details about calculation of retail price you can find in this article. Basic input to do the calculation is Distribution chain, which is set in Organization/Calendar tab of site master data. Additionally for sites of type distribution centers different distribution chain can be set for valuation purpose – on valuation tab of site master data (this setting is not valid for retail price calculation, only for valuation retail price). Single article with quantity and value update. For my test article 1288 , material type in site is updated by quantity and value. At site level ‘Valuation at Retail’ is activated. Article 1288 has been created in merchandise category for which revaluation profile has been assigned in the site. Article price is set to 156 PLN at distribution chain level and 180 on dist. Chain and site ZPD3 level. 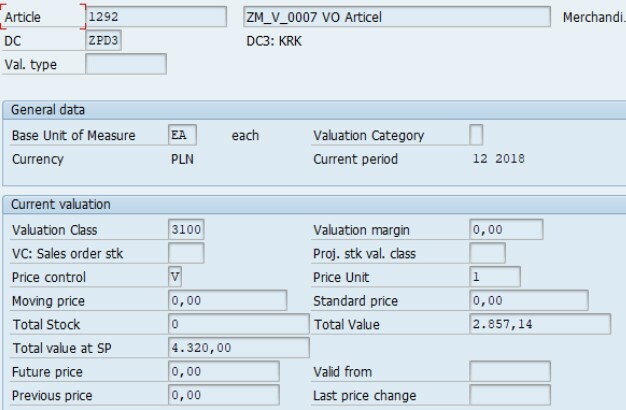 Then I do change of Sales Price (VKP1) from 156PLN to 190 PLN per EA in distribution chain ZSH1/P8. To keep system consistent especially in case of non-quantity managed articles revaluation needs to be done. For this purpose VKU7 tcode can be used to find all relevant changes in the system for revaluation. Revaluation profile that is assigned to site contains information if local markdown is active. By general total value of stock is calculated with sales prices. For revaluation with VKU2/VKU3 sales price used there cannot be changed. If local markdown is active that stock can be partially revaluated with other then sales price value. The purpose of it is that if in shop local price has been set different then in central system, valuation would be reflected in central system but taking into consideration local price. This setting has also effect on POS inbound idoc processing. POS inbound profile assigned to site contains calculation schema for billing document and three conditions, sales price (default PN10) valuation price (default PBEW) and FI valuation price (default PBFI). 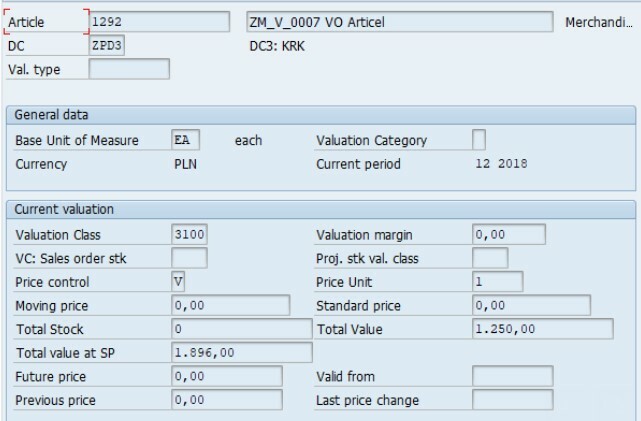 If Local markdown checkbox is set Sales price and FI valuation price is taken into account during goods issue (visible in accounting document created for it) and reduced value of stock in accounting view in article master data. 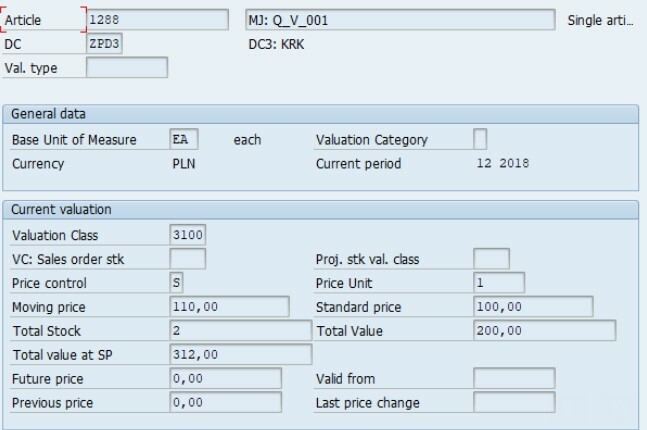 If Local markdown check box is not selected than FI valuation is taken from accounting view (assuming article is managed with quantity and value at site level) and total value at sales price is decreased with calculated sales price but not transferred in Idoc. Local markdown setting has also impact on Stock transfer Order valuation. Revaluation profile in receiving site is set to 3 (no local mark down). In this case in receiving site, revaluation document is created to post differences between two sites. As in classical movement of goods between two sited, valuation is done with value coming from issuing site. If in receiving site revaluation profile include local markdown there is no revaluation document created and price of issuing site is taken in receiving as sales value of moved quantity. 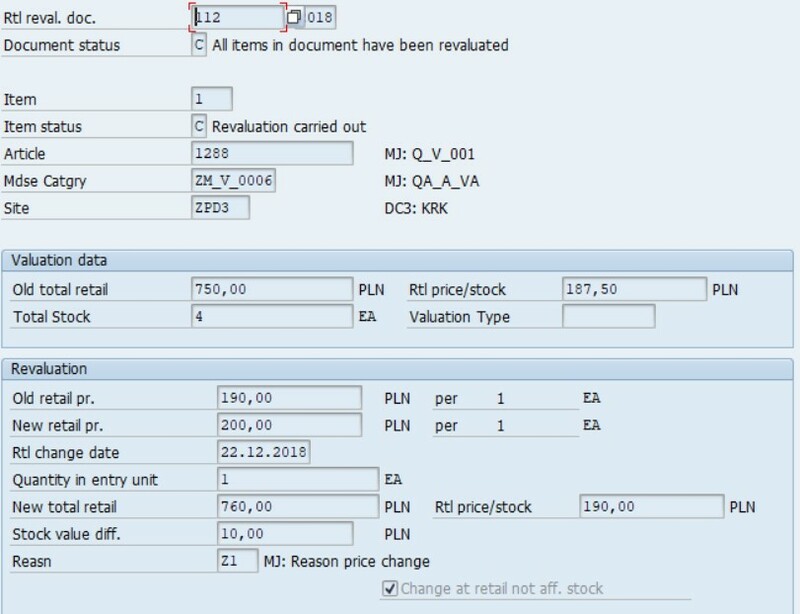 Additionally to steer this setting there is a configuration in Basic Data Retail that tells on which side revaluation document should be created. Option 0 and 2 are the same and revaluation document is created in receiving side with value of issuing side. Parameter value 1 says, that revaluation document for moved quantity is created on issuing side with value from receiving site. Article with only value assignment. In this scenario, multiple articles are created with same merchandise category. In site master data, the merchandise category is marked to collect value of articles and quantity of respective articles are not recorded. Value is captured in so called Merchandise category article. When you create merchandise category then there is an option to created article that will collect value. By default article type is WERT – Value-only materials. On site level there is an option to assign to merchandise category exception articles that are managed independently despite that merchandise category is managed on value only. 1289 – price at distribution chain 216 Pln and site ZPD3 252 Pln per EA. 1290 – price at distribution chain 312 Pln and site ZPD3 336 Pln per EA. To merchandise category ZM_V_0007, value collecting article 1292 is assigned. To see valuation of value article you can use transaction WMBE. After creating new Purchase Order and doing Goods receipt for 5 EA of each article – 1289 and 1290 Total Value is 3000 and Total value as Sales Price 4536. For value only articles when Goods Issue is done for one of the articles without quantity update, system needs to calculate value of issued quantity. The cost value is deduced from the retail value on the basis of a factor that is described as the cost multiplier or cost complement. Let’s see a goods issue of 1 EA against Sales Order. Changes are of course recorded at the value collector article.